With the warmer weather finally making its way into the Midwest most of us will find ourselves participating in outdoor activities, and grilling our meals rather than heating up the kitchen. Nothing satisfies better than a cool drink on a scorching hot day, but not just any drink. You may prefer an ice cold frosty mug of beer, a tall glass of iced tea, refreshing lemonade, or just a simple glass of ice water to beat the heat. 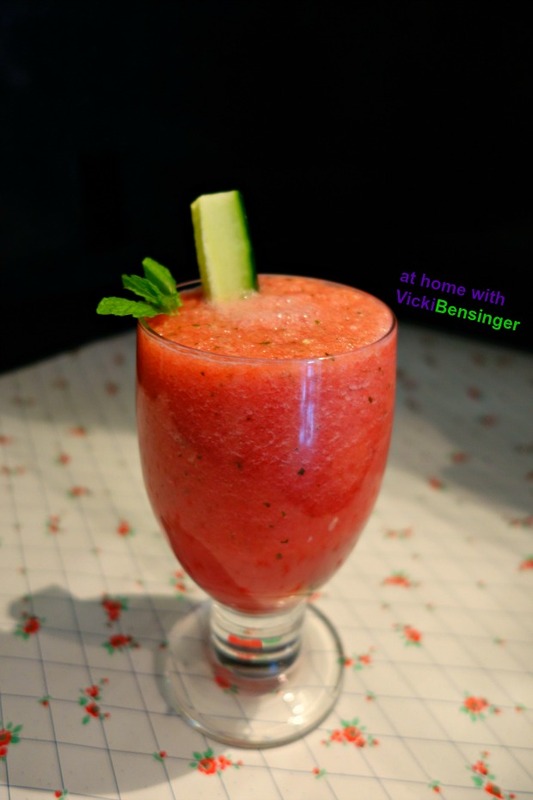 However, this refreshing Watermelon Cucumber Cooler will cool you down, and balance out your system especially after a barbecue. 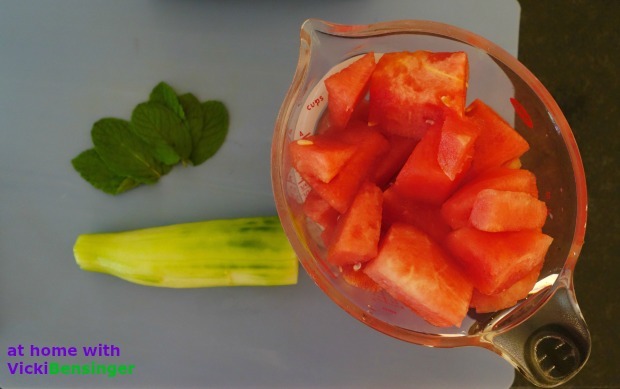 Both watermelon and cucumbers are considered alkaline foods helping to balance out those sauce laden BBQ dishes, vinegar salad dressings, pickled foods, and beef dishes you may have indulged in. 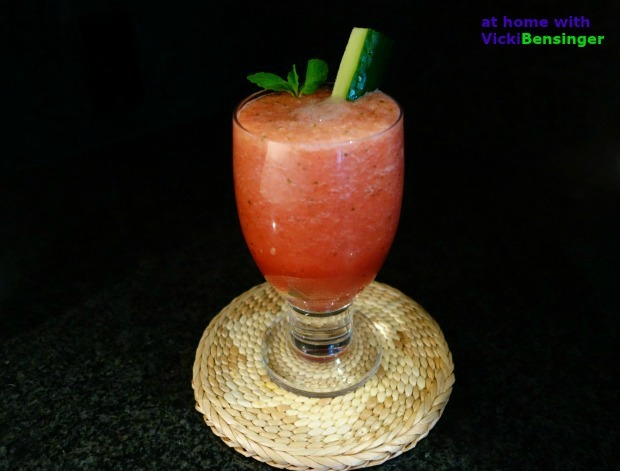 Instead of taking an acid reliever, a tall Watermelon Cucumber Cooler may work just as well – it’s worth a shot! Aside from that, this Watermelon Cucumber Cooler with a hint of mint, is tasty and refreshing, especially when served ice cold. If preferred, blend then pour into Popsicle cups, freeze, and serve for dessert. What could be better? With only 3 ingredients it whips up in no time. Serve immediately or store in Mason Jars and refrigerate to drink later that day. Best served that day. 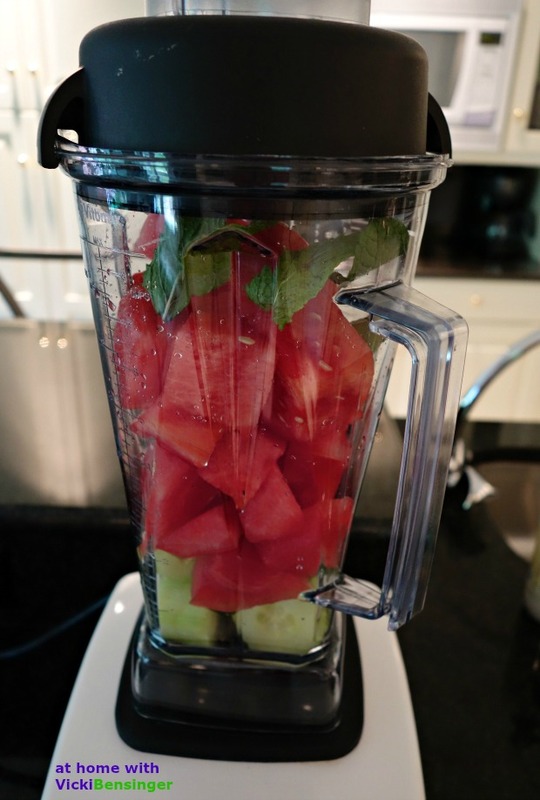 Place all ingredients in the order listed into a blender. Serve ice cold in glasses and garnish with a sprig of mint and cucumber stick. Alternatively: Pour blended mixture into Popsicle containers, and freeze for later. Cool, refreshing and yummy! Can’t beat that combo in the summer!!! Agreed! I hope you’ll give it a try. So simple! So tasty! Just what the doctor ordered for this heat. Thanks! Plus it’s a high alkaline beverage so it will help balance out any acids in your system – helping you to feel even better. All the more reason to try this. Absolutely refreshing! A great summer drink. It is so refreshing. I made some popsicles with some of it and WOW that’s truly refreshing! 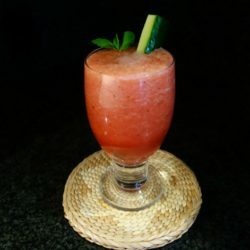 Great idea to combine cucumber and watermelon!!! Can’t wait for the summer watermelons to show up so I can make this. This is going to be perfect for the middle of the summer. Our watermelon has just started to taste sweet and delicious so I would think yours would be good now as well. Pure perfection! Love coolers! Yours sounds awesome! I love it! If you’re not a fan of mint then you could leave it out or try using some basil. It’s so refreshing and quick to prepare. A match made in heaven! Cucumber is such a good balance for watermelon. I love watermelon and cucumber together! This sounds so refreshing. Wow, this sound delicious…so refreshing…perfect for the warm weather.